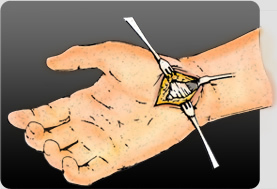 Faster, more comfortable recovery from Carpal Tunnel Release Surgery is available! 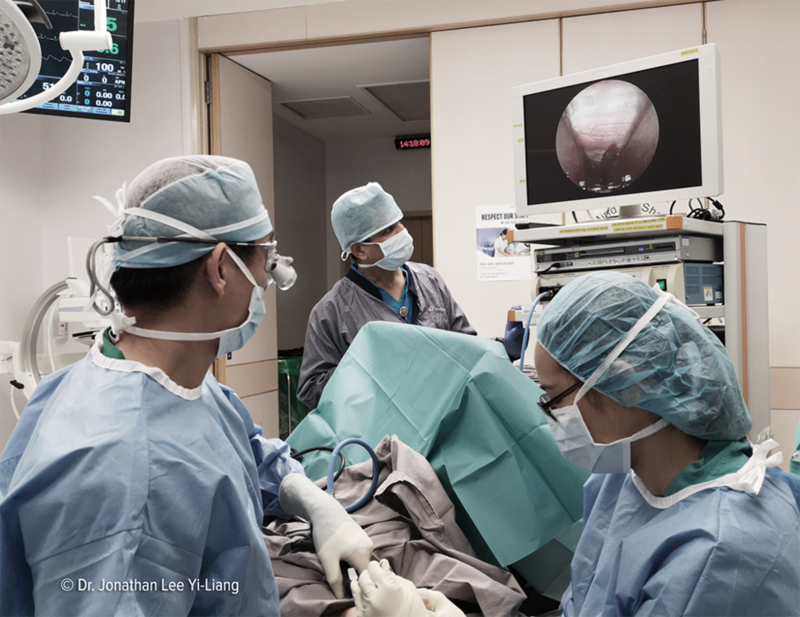 Singapore Hand Surgeon Dr. Jonathan Y. Lee discusses the Endoscopic Carpal Tunnel Release System, and how it has changed his practice and improved patient outcomes and satisfaction. ENDOSCOPIC CARPAL TUNNEL RELEASE (ECTR). In the center of the wrist, there is a space called the carpal tunnel where the major nerve (the median nerve) and nine tendons pass from the forearm into the hand. A very strong ligament forms a roof over the tunnel. When there is swelling in the carpal tunnel, pressure is put on the median nerve, which supplies most of the fingers and thumb with feeling and movement. When pressure becomes great enough to compress the nerve, Carpal Tunnel Syndrome may occur. The most common symptoms of Carpal Tunnel Syndrome include numbness, tingling, burning weakened grip or pain that may occur in one or both hands, and frequently occur at night. Reducing activities that cause continuous exertion or repetitive use of your hands, or keeping the wrist in a neutral position may help reduce the swelling within the carpal tunnel and relieve pressure from the nerve area. Also, wearing wrist splints at night may relieve the symptoms and accommodate a better night’s rest. Anti-inflammatory medication taken orally or injected into the carpal tunnel may help reduce swelling and relieve symptoms. When symptoms are severe or do not improve, surgery may be needed to make more room for the nerve. Pressure on the nerve is decreased by cutting the ligament that forms the roof (top) of the tunnel on the palm side of the hand. Surgical approaches vary, but the goal remains the same – to enlarge the tunnel and decrease pressure on the median nerve. Early treatment and intervention improves recovery results and (importantly) prevents the condition from progressing, as permanent damage to the nerve that can sometimes lead to thumb muscle weakness and permanent numbness of the fingers. The goal of Carpal Tunnel Release surgery is to divide the Transverse Carpal Ligament and relieve the pressure on the Median Nerve. 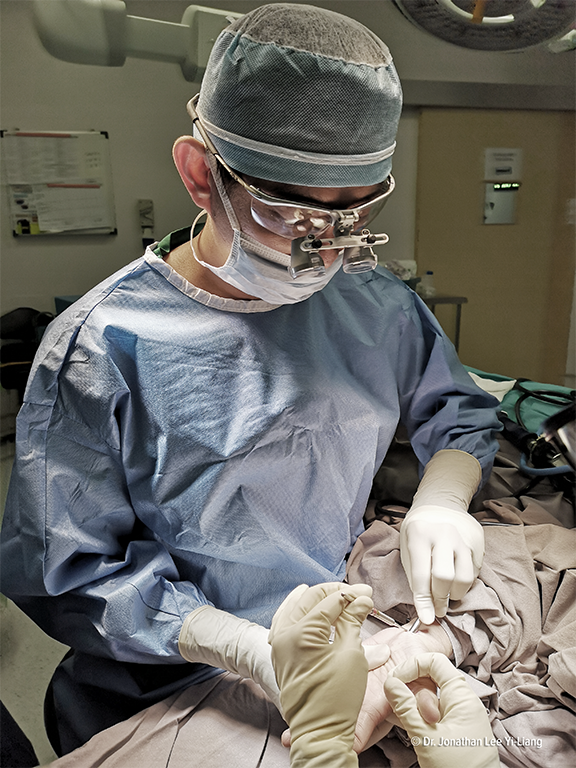 During Open Surgery, an incision is made from the crease of the wrist toward the center of the palm, through layers of skin, fat and connective tissue. Once the transverse ligament is exposed, the surgeon cuts the ligament with a blade to release the pressure on the nerve. The surgeon the closes the incision with sutures and dresses the hand. The procedure is effective; but it may not be the best option for some patients because it leaves a scar from the wrist to the center of the palm; and recovery and rehabilitation can take several weeks due to post operative pain, the deep cutting of the hand and a longer incision. 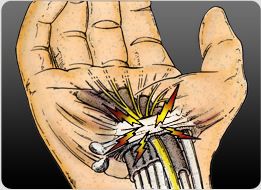 Endoscopic Carpal Tunnel Release minimises trauma by utilising only a small incision at the wrist. During single-portal Endoscopic Surgery, a small incision is made in the crease of the wrist, where the surgeon inserts a small camera mounted to a surgical instrument called a SmartRelease Carpal Tunnel Release System (CTRS). This device allows the surgeon to see inside the carpal tunnel using a video monitor. The surgeon then precisely cuts the ligament using a retractable blade with the SmartRelease CTRS, without opening the entire palm. Once the ligament is fully release, the blade is fully retracted, the instrument is withdrawn and the small incision is sutured and dressed. The guiding principle of this minimally invasive procedure is to minimize post-operative pain by avoiding an open incision extending from the wrist across the palm. Endoscopic Surgery is highly effective and has been used for more than 20 years. It results in less post-operative pain, a minimal scar concealed by a wrist crease, and generally allows patients to resume some normal activities in a short period of time. What are the benefits of Endoscopic Surgery vs Open Surgery? Endoscopic surgery shortened the recovery period as compared to open surgery. While individual results vary, most patients retum to normal daily activities within days after endoscopic surgery and return to work earlier than those who undergo the open surgery. Recovery of hand strength by open surgery can take weeks or even months while the palm heals. Endoscopic surgery results in less pain and scarring. Only a very small scar which conceal in a wrist crease, remain after healing. If carpal tunnel surgery is needed, your doctor will help you make an informed decision by explaining your surgical options and the risks associated with both the open and endoscopic procedures. If you choose the endoscopic surgery, your doctor will also explain to you that there is a very small chance the surgery would have to be converted to the open surgery. Carpal tunnel release has been proven to be a highly successful surgery with excellent results for most patients. Your doctor will be happy to answer any questions you may have about CTS and its treatment. With either open or endoscopic surgery, the incision will be sutured. Your wrist and hand will be dressed, and gentle hand exercises will begin soon after surgery. The time it takes before you can resume normal activities and return to work will varies with each individual. This is a decision that should be made in consultation with your doctor. If you might have numbness in the hands, or suspect that you might have Carpal Tunnel Syndrome; If you wish to know if you are suitable for Endoscopic Carpal Tunnel Release procedure. Call our clinic to schedule a consultation with Dr. Jonathan Y. Lee, at (+65) 6737-1100 or 6440-1200.